Turbot has become my new favorite fish. At first blush, it’s light, mild, and delicate. But a heartbeat later you realize its meaty, dense, and packed with beautiful flavor. Pair it with this seasonal and politely assertive sauce and you’ll really get your loved one’s attention on a cold December night. Most importantly, the ingredients are familiar and the techniques are pretty basic. It’s a can’t miss weeknight meal that’s quick, healthy, satisfying and elegant. I can hardly believe something so simple could make such an impact. It’s a beautiful dish. Turbot is popular on European plates, but lately it seems to be making its presence known in American eateries and grocery stores as well. If you can’t find it, ask your fishmonger. The success of this meal is directly related to the quality of the ingredients. Find the best mushrooms you can. These were from the Greener Grocer and perfection. This is a modified version of a dish found in Rick Stein’s Complete Seafood. You must own this book. In a large, lidded sauté pan, add a splash of olive oil and the sliced bacon. Fry until golden. Turn down the heat, add the leeks, parsnip and garlic. Soften for about 6 minutes. Add the butter and let it melt. 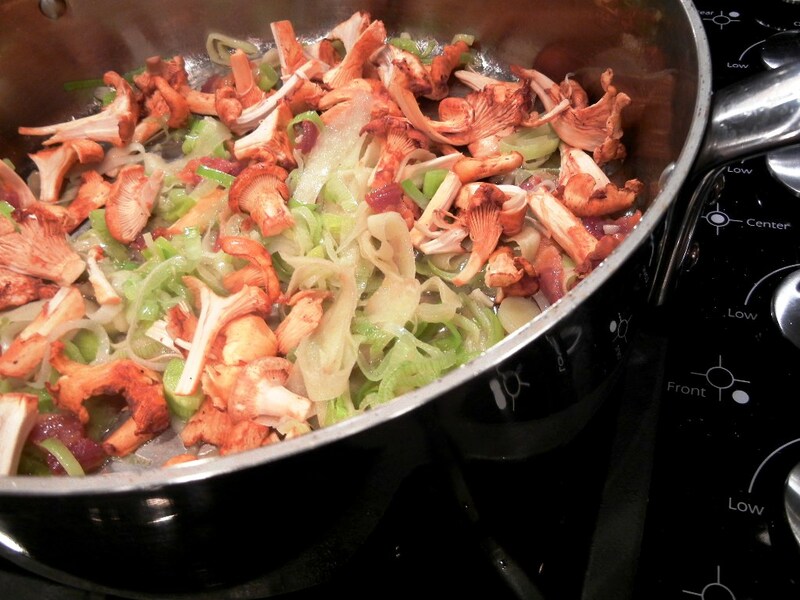 Stir in the mushrooms, coating them in the butter and leeks. Pour in the vermouth and scrape down the pan. Add the stock. Simmer for 8-10 minutes. Check for seasoning. Check the fish for bones and remove any with tweezers. Fold the turbot fillet in half and lay it on top of the mushroom mixture. Season it with salt and pepper. Ideally, you’d like to drizzle it with truffle oil, but olive oil is okay too. Put the lid on and gently simmer over medium-low heat for 10 minutes or so. It’s done when flaky and no longer translucent. Serve either with your best mashed potatoes or another root vegetable mash (half butternut squash, half potato is incredible). Place half the fish atop the mash, and spoon generous amounts of the mushroom/leek/parsnip/liquor over the lot. It’s very good. Playlist included Bedroom Eyes, by the supremely wonderful Dum Dum Girls.